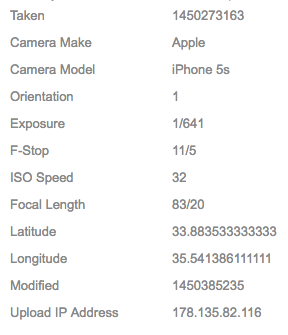 … and why you should really have a look at it. Since 2010, Facebook allows you to download an archive file of all your interactions with the network. It’s a 5-click easy process that your grandmother can do (more details below). Inside the .zip, lies an ‘index.html’ page that acts as a portal to your personal data. Visually, it looks like an ad-free stripped down version of Facebook that’s actually quite relaxing. As I’m trying to reduce my exposure to social networks, I decided to take a look at this info. By extrapolating the data of a single individual (me), I might be able to better apprehend the capabilities of the beast. In the end, it all comes down to what is tracked and what can be deduced from that. … we just don’t fully realise it. Everything you expect is there: your profile, statuses, messages, friends, pokes (Tinder’s ancestor), photos, videos, comments, events. All of it in a 500mb zip file. There’s a lot of material and you could sift it for hours. Most of the content is unsurprising but there are a few notable facts that are worth exploring. Quite simply, Facebook never deletes anything. Unfriended friends, past relationships, former employers, previous names, address book: you name it. I created my account Friday, September 14, 2007 at 10:59am and all my actions have been recorded ever since. I feel that for the first time in history, 10 years of consistent human behavior have been meticulously gathered, stored & analysed. Every time you open Facebook, the time, location, IP address, browser & device have been recorded. If you’re part of the 1.4B people that use Facebook on a daily basis, they have enough data points to determine your everyday life patterns with great accuracy: home and work address, daily commute, wake up & bed time, travel duration & destination, etc. Apparently, Facebook has 232 examples of what I look like. How does it know? Well, every time you tag a photo, you’re adding to an enormous, user-driven wealth of knowledge and data. Everyday, billions of people are telling an algorithm what a human face looks like, from different angles, at different ages and in different light conditions. The result? Facebook allegedly said that its image recognition models could recognise human faces with 98% accuracy & that it could identify a person in one picture out of 800 million in less than five seconds. When you install Facebook’s app on your phone, you give it the right to see your contact list. Once that’s done, Facebook keeps ALL your contacts information forever. There’s no sneaky move here: the opt-in process on your phone is actually pretty clear about that. But seeing the phone numbers, emails & addresses of everyone you know (or knew) listed on Facebook is a bit disturbing. … because he surely knows you. Facebook main revenue source are ads served by their powerful targeting engine using custom audiences built for advertisers. Playstation seems to like me a lot. 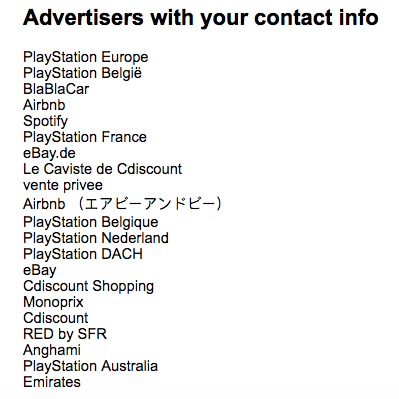 Advertisers do not give Facebook any users’ contact details. We only get such details in hashed form and they are, in any event, deleted within 48 hours. We are therefore not able to confirm what contact information an advertiser has for a particular user. But looking at Facebook Business platform provides some details about what info is used in custom audiences targeting: email, phone number, first name, last name, city, state, country, date of birth, age & gender. So Facebook has a lot of data about you & it shares it with a lot of advertisers: but why should you care? I used to think there was no real drawback in ceding a lot of personal data to a 3rd party. After all, I get a free service that’s pleasant to use & really helpful. Eventually, I realised that the harm potential really depends on 2 factors: the intentions & means of action of the organisation that harvests your data. Harm potential = money * financial KPI’s — regulatory pressure. That’s where Facebook gets really frightening: it’s hugely powerful & its only objective is to maximise the time spent & interactions made with its platform (just look at its financial KPI’s). Don’t be fooled by the “bring the world closer together” motto: if Facebook’s here, it’s only to make money by selling ads. And to do that, they must target — in the most precise manner — the highest possible amount of eyeballs. The thing is, do we really care? Starting with Facebook in 2010 and followed by Google and Twitter in 2011 and 2012, big social networks began allowing their users to download a backup file of everything they’ve ever posted. To download your Facebook backup, just follow the 3 steps described here. Facebook will send you an email once your backup’s ready (it usually takes less than 10 minutes). For a more holistic approach, check out PersonalData.io. It’s a web service that‘s helping individuals get a hold on their personal data. They’re doing an awesome job referencing data controllers & providing request templates filled with the correct wording & legal jargon. They then publish the requests & answers online so that everyone can appreciate corporate lawyers’ talent for complexifying exchanges & dodging questions. Most facts presented in this article are sourced from these reports & websites. If you wish to learn more or make your own opinion, I think they’re a good starting point. Facebook machine learning - Stacey Higginbotham from Fortune magazine wrote really interesting stuff on that topic. Facial recognition legal issues - The Daily Beast’s thorough report taught me a lot. Archiving your social media data - Liana Bandziulis published a great article on that topic in WIRED magazine. Only 20% of readers reach this point. I’ve learned most of what I know through the writings of others. Having people take some of their time to read my work means a lot to me. You can find me on Twitter 🐦 , Instagram 📸 or here on Medium ✍️.